When it comes to weddings men are largely ignored while all attention is diverted towards the bride and her outfits for various ceremonies. But in this contemporary instagram era where every minute detail is given lot of importance even men are putting in efforts to look royal to complement their beautiful brides. 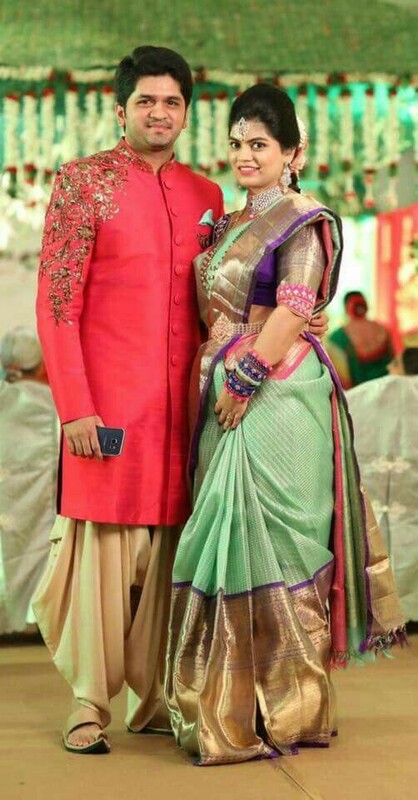 Florals can be a tad bit too bold for men but if you are having a summer wedding florals is an apt choice which is not only going to look trendy but is also going to help you match up with the style quotient of your bride. Vibrant and bright floral prints are not easy to pull off so, we have a more subtle alternative in the form of dull floral embroidery. These placement embroidered sherwanis are a refreshing pick away from the same old heavy work sherwanis in beige and maroon giving you a truly unique and distinct groom look. 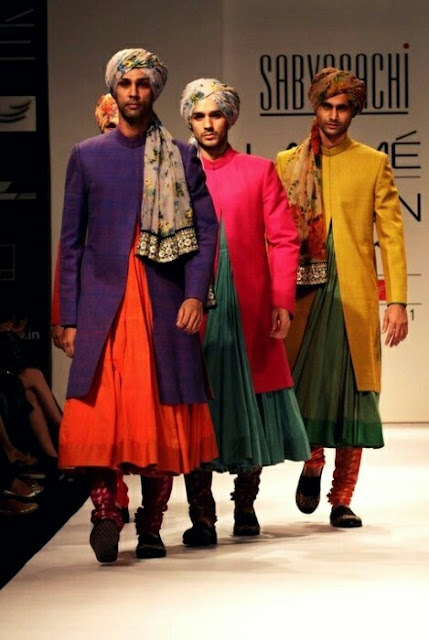 Ombre's a huge womens fashion trend and now it has slowly but surely crept into mens ethnic wear. 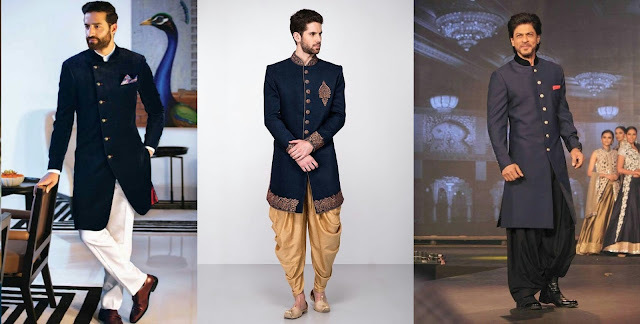 If you really want to grab attention on your wedding day then ombre is a sherwani trend you should consider but take note that you will need plenty of confidence to carry this off . I feel this trend is more suited for pre wedding ceremonies like mehndi or haldi. 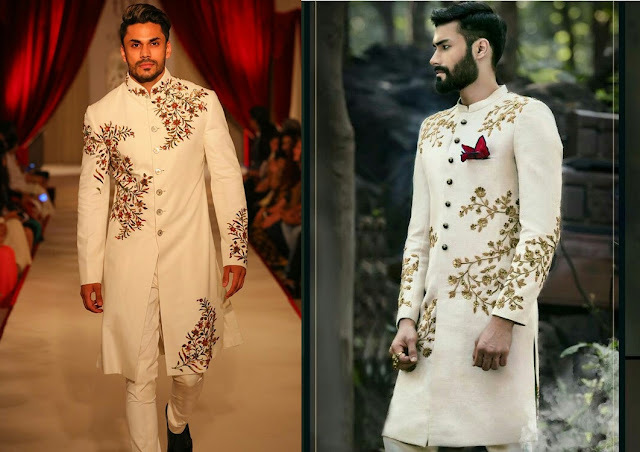 If you are a groom who finds this ombre trend intresting but are not comfortable flaunting it for your big day then skip going for an ombre sherwani and try an ombre kurta for mehndi ceremony. Groom fashion has evolved a lot in recent years and they are not just wearing intresting styles and cuts but also very new age hues. We have spotted grooms in all sorts of colours from liliac to pink but this wine sherwani is totally striking. just the colour is enough to help you make an effortless statement. This bold shade works well for a evening wedding and is gonna look smashing wow on groom giving a very contemporary appeal to your wedding look. Attached dupattas to lehenga blouses are hassle free and why cant grooms have attached stoles? These new age sherwanis come with attached stole for an effortless fashion statement. 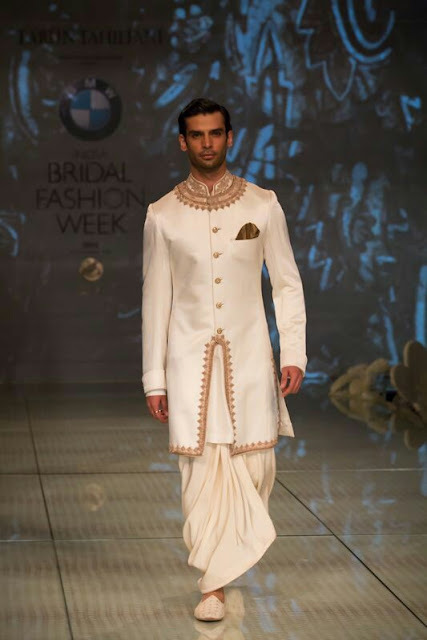 You can even add a belt to your normal sherwani and tuck in your stole for a hatke kind of groom look. Vibrant and bright floral sherwani which works best for a day wedding is all you need to spark of trends with your wedding. You can try this style for your wedding or for mehndi ceremony to match beautifully with your glam bride. If you dont want to move out of your comfort zone then opting for classic sherwani styles is the safest way to go. A Basic Sheridan in traditional cream or beige contrasted with maroon looks elegant and emanates regal charm. Even in this colour scheme you can look for design variations as a lot of stores stock many styles and designs in beige, white and cream sherwanis. If you are a man with very western style sensibilities then going all traditonal on your big day would be a good idea. If you want a bit of personal style to shine in your wedding attire best way forward is to try contemporary sherwani designs. 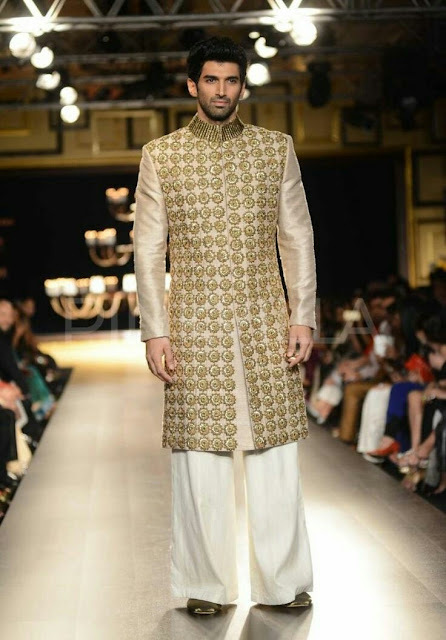 This Indo-western sherwani for groom is bold and hot in trend. If you are having a destination wedding or want a fusion look for pre wedding ceremonies like mehndi, engagement or sangeet then this latest sherwni design is an ideal pick. Prints have taken over the world of mens fashion and why should ethnic wear stay away? The prints arent your subtle subdued stuff which is creating waves, prints here are striking to make sherwanis stand out. If embroidered or embellished is not your thing then try a printed sherwani and balance things out with a plain stole and plain bottoms. 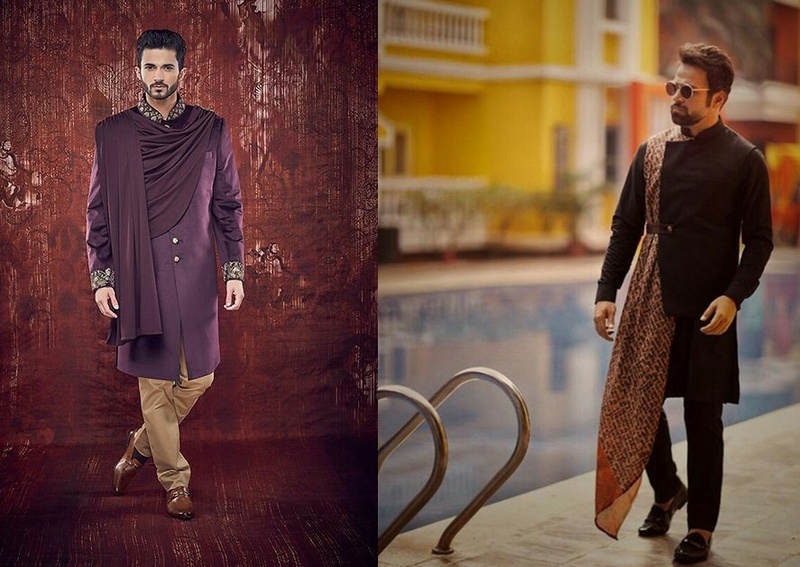 If prints are too quirky for your liking then you can choose to go for a plain sherwani in a basic hue and add a printed stole to make it groom relevant wedding look. For their delhi reception Virat Kohli opted for a similar style sherwani and stole the show. Angrakha is another sherwani design which is traditional yet interesting. This design in an off beat or jewel toned colour is sure to make your look stand out. This is also a great idea to match or contrast with your bride if she is wearing a rich fabric like velvet or silk. If you are having a day wedding pastel sherwanis will work well making you a head turner. 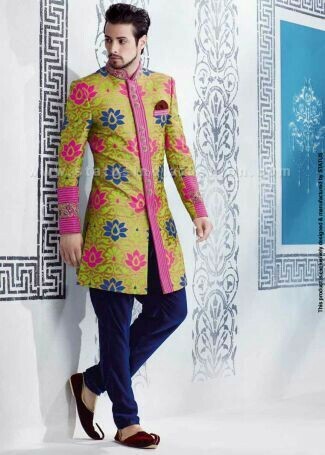 This classic style sherwani with a fun colour and golden thread work is from manyavar and is priced at 17999 INR. Buy online here. If there is one colour men trust after black and white it is blue. 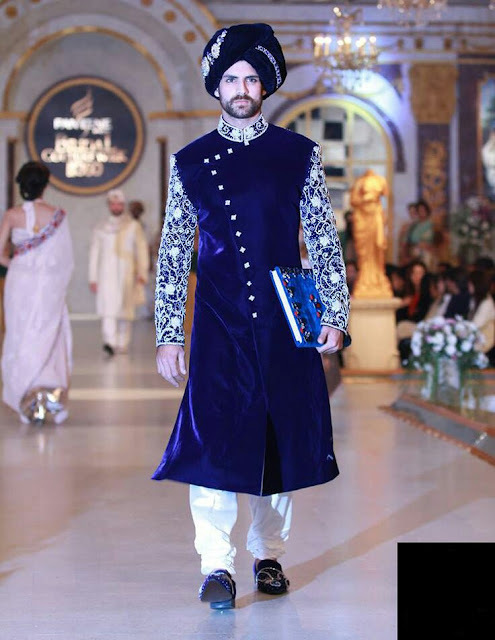 Dark blue actually makes for a gorgeous sherwani shade without making you look like you are trying too hard. 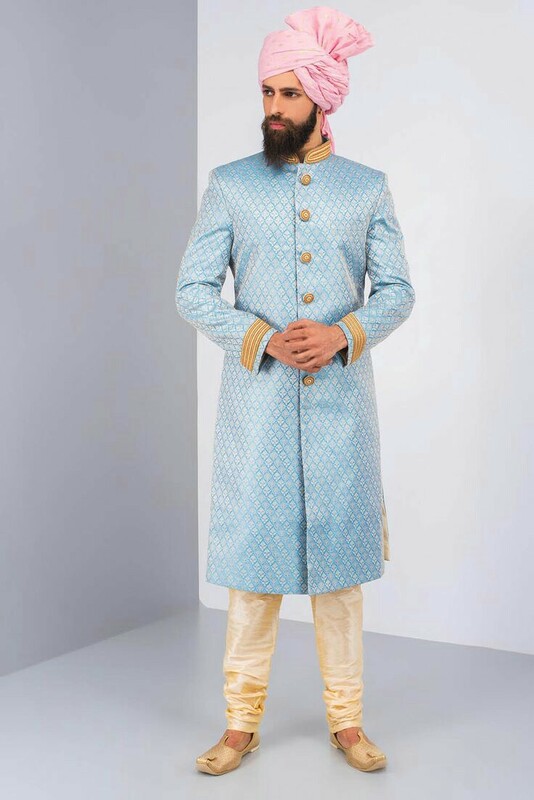 If you really want to look unique even in a simple blue sherwani I suggest you experiment with bottoms. Patiala salwars, dhoti pants or even trouser cut bottoms, try a new silhouette and watch your look pop. 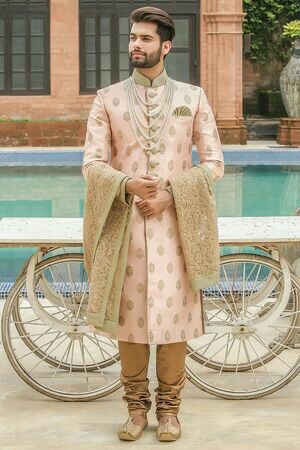 Another one of those serene new hues to take the mens wedding fashion by a storm is the powder making for a stunning contrast with pink bridal outfits. Icy blue hue is actually easier to carry off than other trending shades like pastels, mint, mustard etc because blue is supposed to bea boyish olour right? Definitely consider this colour for an amazing day wedding look which is gonna steal all attention even from your pretty bride. The basic white colour with heavy sequin and embroidery work gives you a fit for groom sherwani design. 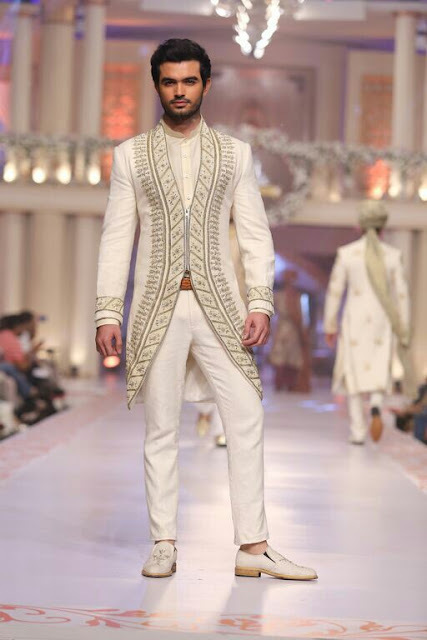 This white sherwani gives a crisp and classic look but what adds an element of fun are the flared palazzo style bottoms. Grooms the best way to experiment yet not go too over board is to pick a design element you want to play with. 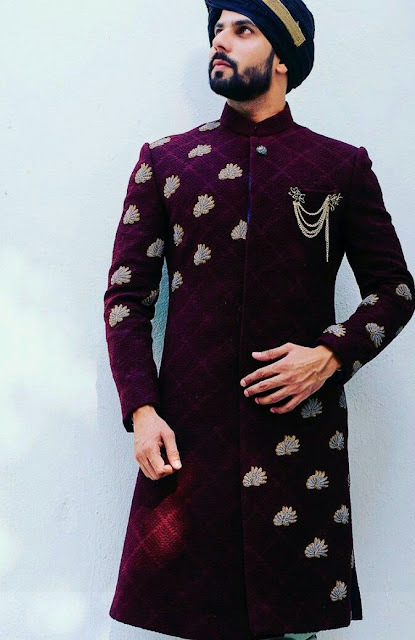 Either make the colour stand out with classic cuts or choose a basic colour and experiments with bottoms and viola you have a trendy groom look ready which doesnt scream quirk. Why so buttoned up at your own wedding? Let yourself loose and have a blast as it is the most memorable day of your life. 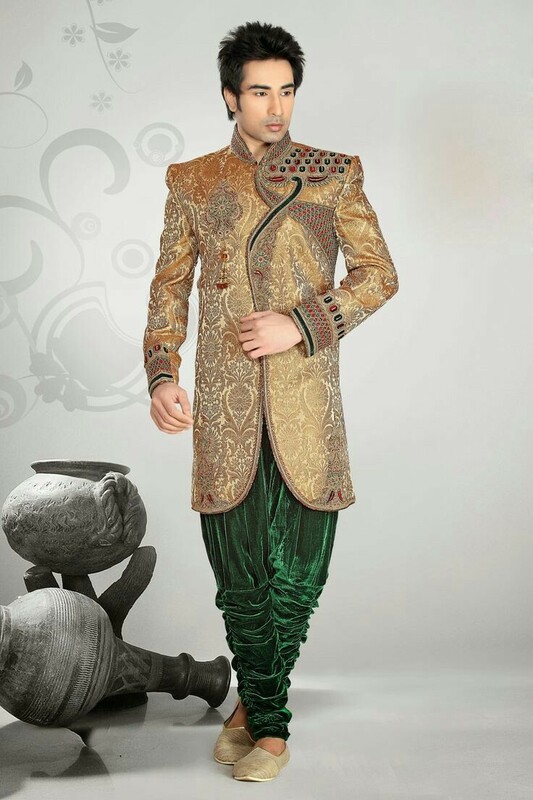 Choose the sherwani style which is trendy and fun. A layered open button sherwani is stylish and uber comfortable. After your wedding rituals are done you can just bid bye to the outer layer and party like there is no tomorrow! 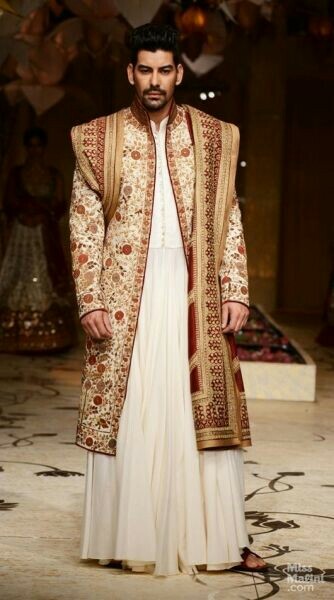 But make sure to skip stole for a sherwani design like this or the whole effect will get subdued. Velvet sherwanis are quiete a rage these days with even high end labels churning out velvet sherwani designs. 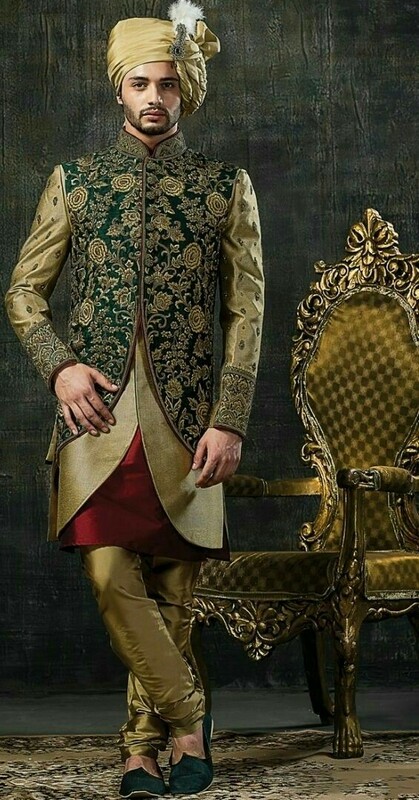 The latest velvet sherwanis dont have embellishments but intead use intricate embroidery to as a design detail. The embroidery is also not your usual flowers and vines but fascinating motifs like birs, elephants and the likes. Normal hemlines are a passe. Try all new asymmetric hemline sherwanis for impactful groom look to math your glam at every step. These kind of overlapping hemline sherwanis work best for reception or engagement giving you a fusion ethnic appeal. Pair with contrasting bottoms to make the trendy hemline stand out . 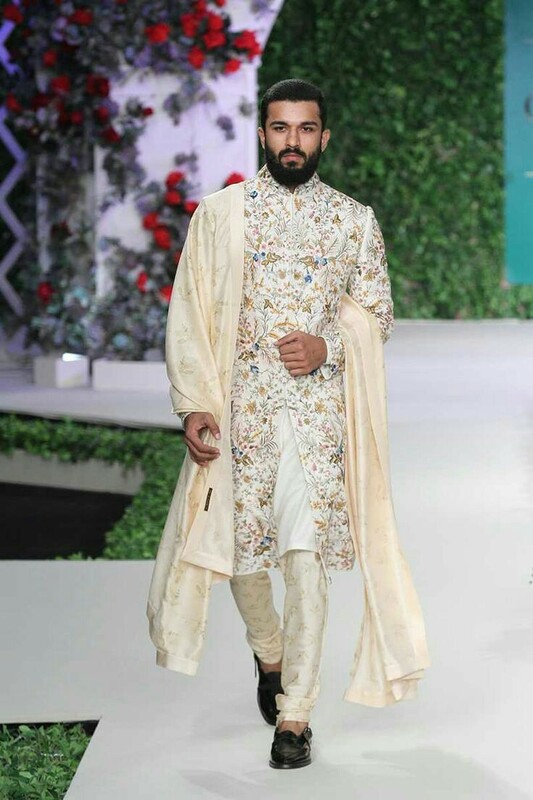 Floral printed sherwanis are huge this season especially since Indias top designer Sabyasachi mukherjee churned out a whole line of florals for men collection. This fresh trend is more wearable than you think and blends seamlessly creating a co-ordinated bride groom scenario for photo perfect wedding look. Velvet embellished sherwanis arent new but if you want to try this style give an intresting spin by layering it over a longer contrast kurta. Pair with chudidaar bottoms and go for minimal styling letting your silhouette make a statement of its own. 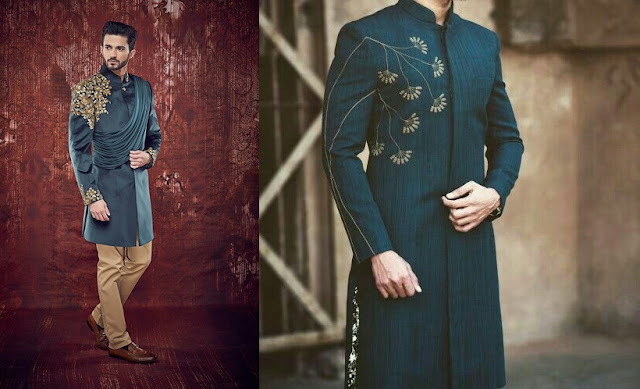 There are many sherwani designs cropping up with every new fashion week session. If you are looking for a more modern design then select a sherwani like this grey one which is plain but features an interesting triangle printed flap on the upper half. 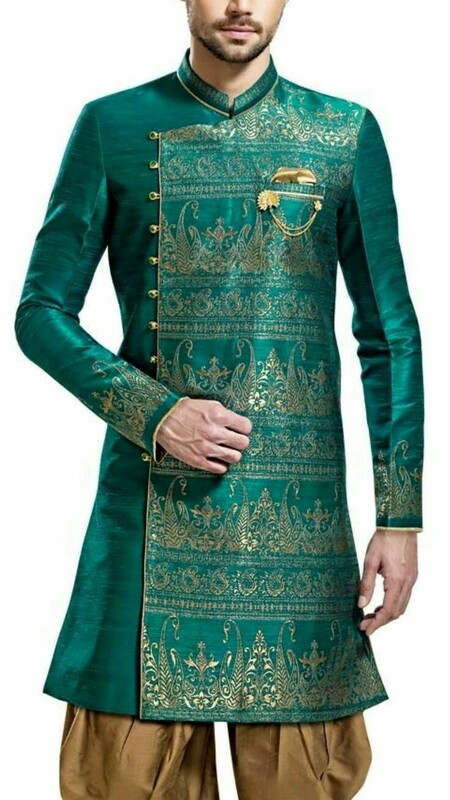 This kind of latest sherwani for groom is perfect if you are having a beach wedding. You can even dabble in styles like these for ceremonies like mehndi or sangeet. A bold rich colour and fabric layered over flared anarakali style kurta gives you a eccentric sherwani for groom fit for royals. 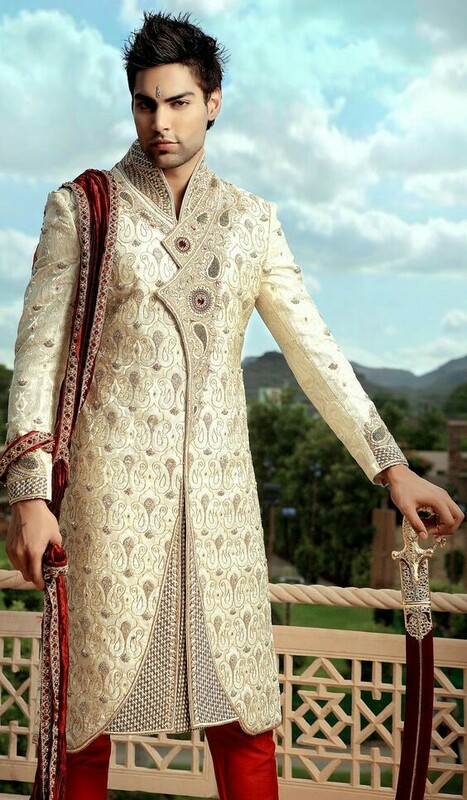 If you are a groom having a destination palace wedding this new style sherwani design you can pick. The sherwani design is a bit quirky but the colour pallet balances it out adding a traditional edge while the regal velvet fabric lends a luxurious appeal. All grooms aspire to make a fashion statement on their big day. A layered and tulip cut sherwani spells a strong style game yet retains a traditonal touch in your wedding look. 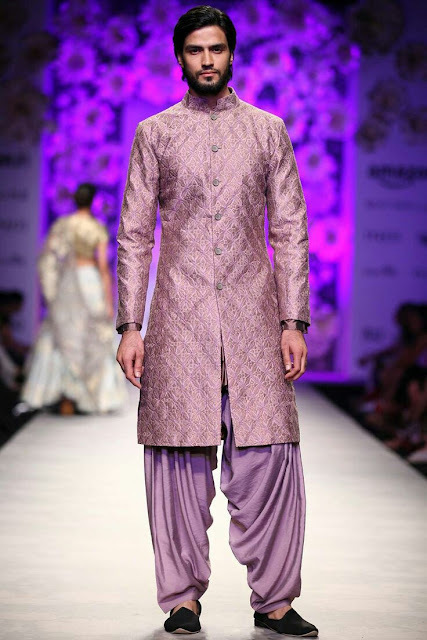 This is one of my favourite sherwani styles for experimental grooms. It i wearable yet distinct. Overall embroidery can get a pass as appropriate groom wear but if you like things more subdued then opt for a sherwani in rich fabric and get just the sleeve portion embroidered. 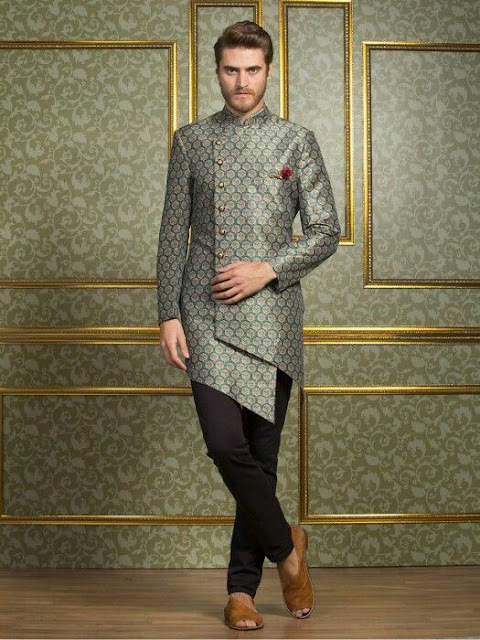 MAke for a exciting sherwani style and also looks super sauve. 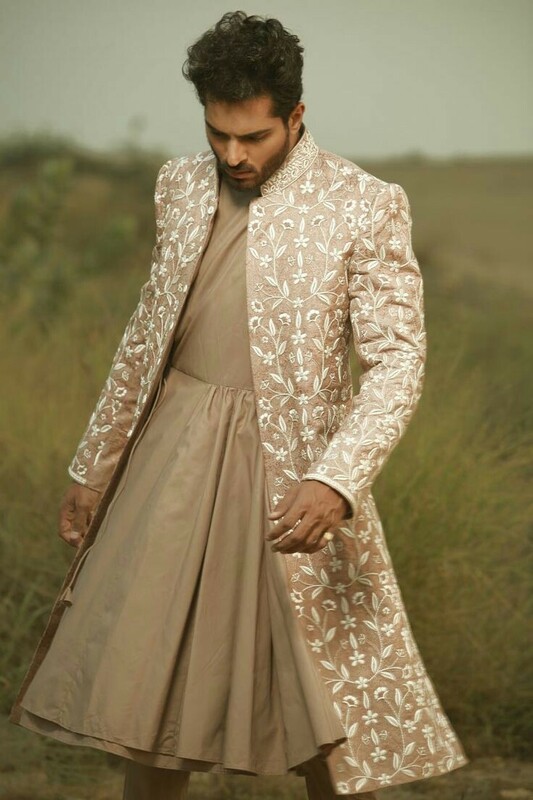 Traditional anarkali style kurta layered with sherwani jacket is all things cool. If your style game is all about trend play then try the Bajirao Mastani inspired anarkali style sherwani atleast for one of your wedding festivities because this one style you can flaunt only at your own wedding or maybe even in a movie role! 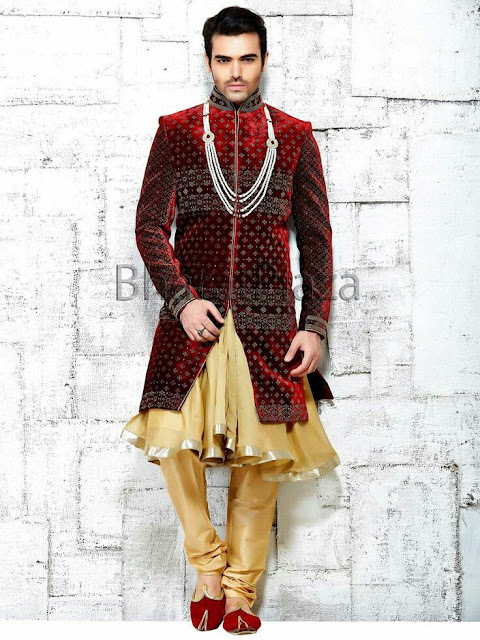 Benarasi or brocade gives a very elegant regal vibe making it perfect fabric for sherwani for groom. 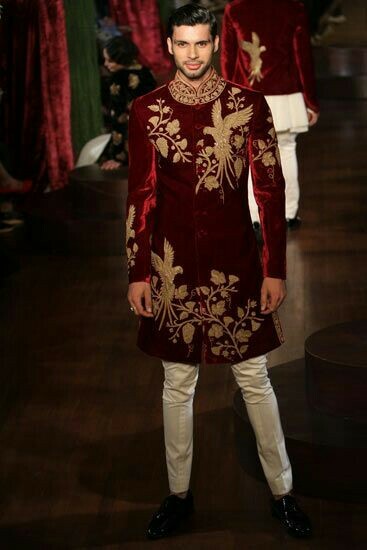 When styled right brocade sherwanis look royal and can easily stand out. 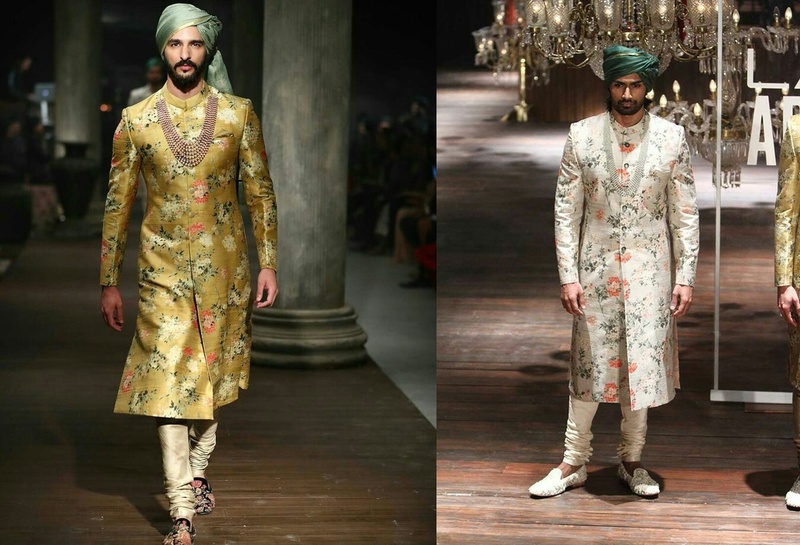 Cant decide if you should give florals a try or just stick to usual sherwani designs? 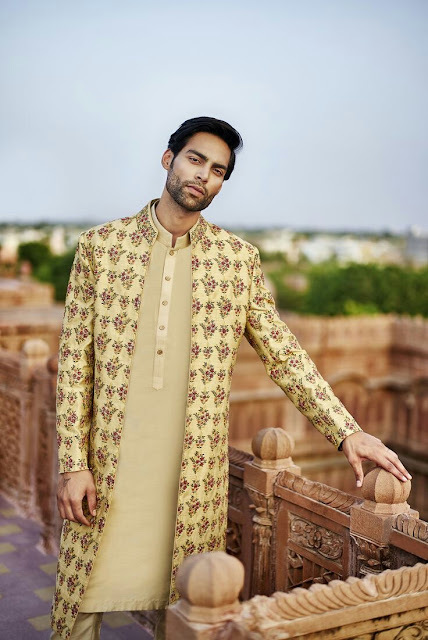 Then try something with subtle smaller floral details like this designer sherwani featuring floral details on in the sherwani hemline and sleeve borders. Unleash the full fashionable you at your own wedding in this arab inspired sherwani style which is as bold as it can get. Strictly for men who are comfortable pushing boundaries of fashion this sherwani for groom is going to be a topic of discussion years after the wedding has been done and dusted with. If not the wedding then this style could make a good sufi night outfit too. 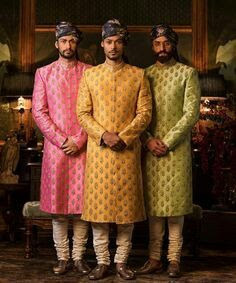 No colour is off limits for grooms these days and liliac is one hot trending groom sherwani colours. This subdues hue hasnt been spotted on many grooms, making it unique shade to rock on your wedding day. Which designer sherwani for groom style are you most interested in? Contrast or match: Decide if you want to contrast or match your bride: Bridal outfits are still going to be given most priority so it is best if you as a groom wait for your bride to finalise her lehenga and then pick your sherwani. You and your bride an then sit down and decide if you want a contrasted look or if you want to go the matchy matchy route. Colour play: Grooms these days are not limiting themselves to blacks, browns, blues and whites. If you are not the experimental kind if is best to indulge in simple sherwani with trendy shade. 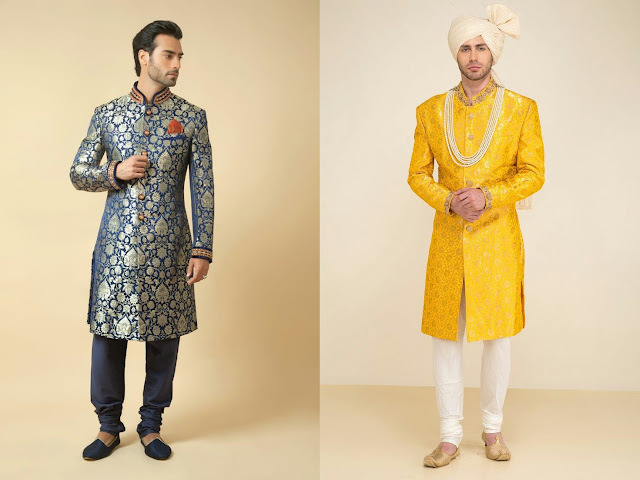 colour of sherwani will depend on your brides outfit and also on the time of your wedding. For summer and day wedding fresher hues are better suited while deep darkerker colours work best for winter or night weddings. Rich jewel shades like emerald greens, and pastels, mint, pale blue are some trending colours for groom these days. Layered sherwanis are hot in trend these days. If you are willing to experiment with layered sherwani styles go for contrasting coloured layers for maximum impact on your special day. 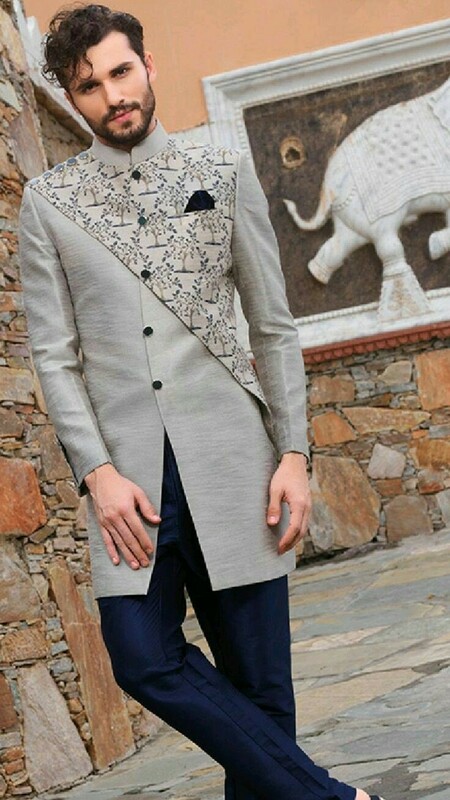 Jacket style front open sherwanis are another big rage these days. Also ombre sherwanis especially for functions like mehndi. Bottom wear experiments all grooms are open for. Instead of the same old chudidaar pair your sherwani with fun bottom style like dhoti pants, patialas or flared pants which are hot in trend . Florals are in: Floral for men is getting very popular. You could consider a floral sherwani to make a statement at your wedding specially if you are having a morning wedding. If you want to try floral trend for pre wedding ceremonies a floral nehru jacket over a plain kurta is a good way to go. If florals are too bold for you then try subtle floral elements like simple floral embroidered sleeves or floral embroidered shoulders or even floral safas. 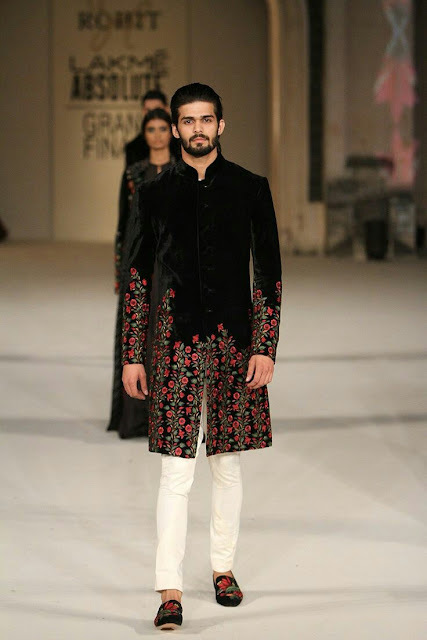 If you dont want to select a floral printed sherwani you could still add florals to your look. A florals safa or pocket square can make your look pop. Even floral embroidery is a nice idea to embrace this trend. Jewel it up: Yes even groom are adding neck pieces to their sherwani looks. These layered pearls lend a regal charm to your whole outfit. Even emerald layered necklaces are a huge hit with grooms but make sure you have a neckline which isnt embellished to add these neck pieces. Brooches and feathers on safas are other accessories grooms can dabble in. Safas were supposed to be very traditional but a exciting new safa designs have been spotted on grooms at wedding in recent years making safa a very trendy and cool accessory every groom must consider sporting. You can choose from floral prints, leheriya, geometric or even pastel safas to match your bride for a well co-ordinated elegant wedding look. 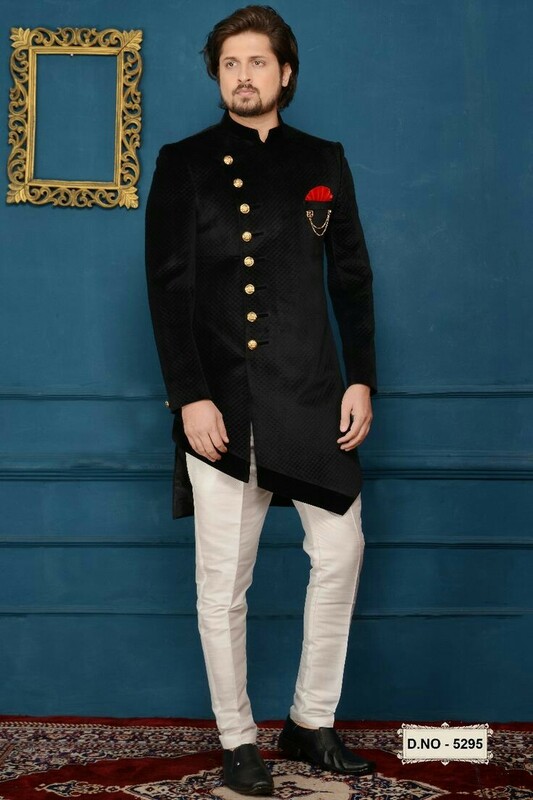 Getting married but cant figure out the best brands or labels for latest designer sherwani styles which are affordable yet stylish? Here I bring to you the best brands to suit every budget. 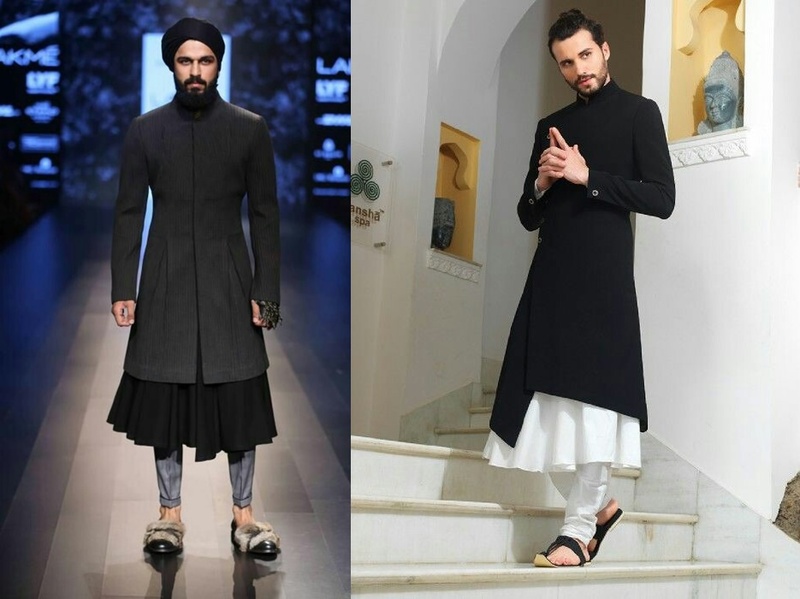 More high end labels to try: SVA by Sonam and Paras Modi, Nivedita Saboo, Siddhart Tytler, Sabyasachi, Kunal Rawal and even Anita Dongre does some very trendy sherwanis for groom but ofcourse the price is on the higher side.